Here in Detroit there are many so many different kinds of sporting activities that you can enjoy. It’s a huge part of our culture and experience of living in southeast Michigan. Whether you're into football, baseball, hockey, or basketball, Detroit is home to a great variety of awesome professional and college teams. Now, there's nothing wrong with catching the game on TV in the living room or at the local bar with the guys, but why not support our local teams by checking out a game live? And really, what's better than seeing your favorite team live, at the stadium, in your own hometown? Sure, you can enjoy a game at home, but can you really match the feeling of being there, of being in the crowd in the moment? One of the biggest hassles of catching a game live, of course, is the transportation. Driving to the town center for a game at Ford Field or out to The Palace of Auburn Hills can be nerve-wracking on a good day, and with everyone vying to get to the stadium in time for the big event of the evening, and concerts too, the roads become jammed, not to mention the hefty prices for parking at the venue. But there is another option. Why not rent out a party bus to transport you and the guys directly to the venue? You can all meet up at someone's house or a local pub, and the party never has to stop just because you're driving! And after you leave the game, you can be transported around town to celebrate your victory, or mourn your defeat (which, of course, would never happen). How does a rubber-pounding night at The Palace of Auburn Hills watching a Detroit Pistons game sound? Every single year, there are tons of live Detroit Pistons games that you can watch right here in your own hometown. With our Detroit Party Bus, you can get yourself a seat to some of the best basketball in the country, all without worrying about driving. And after the game, why not check out The Palace Grille, a fine dining establishment right inside the walls of The Palace of Auburn Hills? Or you could always go out on the town without any worry, thanks to having a safe, licensed, designated driver. So it's the dead of winter, football season is over, but you still need your sports fix. Well, in those hard and cold months, there's always hockey, and with our Detroit Red Wings you are guaranteed a great game. For all you die-hard hockey fans out there, what better way to spend a winter evening than in the stands of a live game, nose to the glass as the team shuffles their way across the ice? The Detroit Red Wings play plenty of games right at Joe Louis Arena in their hometown of Detroit, so instead of sitting back on the couch, why not see a game for yourself? At Comerica Park, you can immerse yourself in some American history by coming out and seeing a Tigers game right here in Detroit. What better way to spend a summer day than practicing one of the USA's most time-honored cultural traditions? From April to October every year, you can catch baseball games being played all around the country. Why not see what it's like to experience a real, American-as-apple-pie baseball game with your local Tigers team? You can have the party bus come and pick you up and transport you directly to the stadium, or you can make a day of it. Whether you want to go out to the game with your buddies, or take your son out to show him real hard working American traditions, our limo bus can help you deal with all of the pitfalls of street travel and parking. Are you a die hard Lions fan? Every year, from September to December, the Lions pit themselves against the best teams in the nation. And every single year, there are tons of live Lions games played right here in Detroit. Why not gather up all your buddies and hitch a ride in the limo bus to Ford Field, where you can get up close and personal to all of the electric energy of a real live game of football? The bus can pick you up and drop everyone off, and you'll never have to worry about traffic or expensive parking fees in the parking lot. If you love sports, why not support your local college teams too? The University of Michigan offers a ton of great sports teams for every season and every flavor of sporting event! Why not check out the Wolverines for some great college football? See these guys perform out on the field before they become stars of the NFL! Or if you'd rather something a bit more unusual, why not seek out a Women's Lacrosse match? You could also go to the Ford Field if you'd like to see a great match of basketball from the University of Michigan. 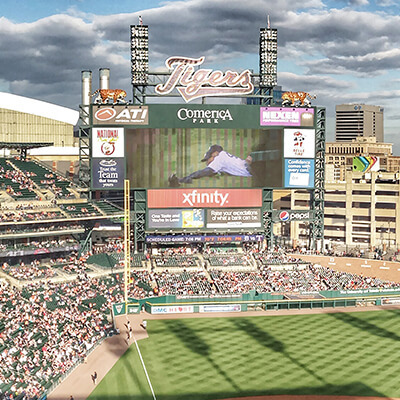 Whether it's football, baseball, basketball, hockey, or something a bit more unusual, Detroit and the surrounding areas are hot spots for the best in professional and college-level sporting events. Whatever sporting event is your preference, we know that it can be frustrating dealing with the details of transportation, parking, and ensuring a safe driver before the event and afterward. Many people get full with team spirit, and often times those situations involve alcohol, so why not play it safe and hire a party bus to take care of all of your transportation needs? Many after-party events go on after games, and with the party bus, you'll never have to stop the celebration to try to coordinate driving! You won't have to worry about parking, the safety of your vehicle, or most of all, the safety of yourself and your passengers. Get out there and enjoy the time treasured traditions of America and Detroit—and party hard with Detroit Party Bus whether your team wins or loses!